Actin represents one of the most abundant and conserved eukaryotic proteins over time, and has an important role in many different cellular processes such as cell shape determination, motility, force generation, cytokinesis, amongst many others. Eukaryotic actin has been studied for decades and was for a long time considered a eukaryote-specific trait. However, in the early 2000s a bacterial actin homolog, MreB, was identified, characterized and found to have a cytoskeletal function and group within the superfamily of actin proteins. More recently, an actin cytoskeleton was also identified in archaea. 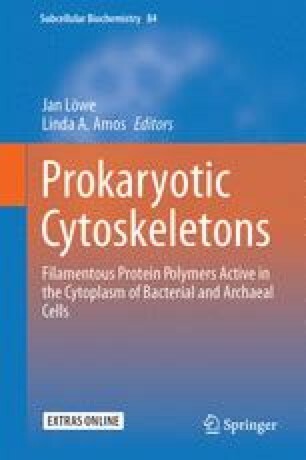 The genome of the hyperthermophilic crenarchaeon Pyrobaculum calidifontis contains a five-gene cluster named Arcade encoding for an actin homolog, Crenactin, polymerizing into helical filaments spanning the whole length of the cell. Phylogenetic and structural studies place Crenactin closer to the eukaryotic actin than to the bacterial homologues. A significant difference, however, is that Crenactin can form single helical filaments in addition to filaments containing two intertwined proto filaments. The genome of the recently discovered Lokiarchaeota encodes several different actin homologues, termed Lokiactins, which are even more closely related to the eukaryotic actin than Crenactin. A primitive, dynamic actin-based cytoskeleton in archaea could have enabled the engulfment of the alphaproteobacterial progenitor of the mitochondria, a key-event in the evolution of eukaryotes.